Do not remove the radiator cap while the engine and radiator are still hot. Pressurized hot engine coolant and steam may be released and cause serious burns. Before performing each inspection, turn the A/C switch off. (b) Warm up the engine. (c) Using the radiator cap tester, increase the pressure inside the radiator to 118 kPa (1.2 kgf/cm2, 17 psi), and check that the pressure does not drop. 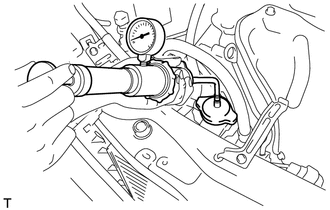 If the pressure drops, check the hoses, radiator and water pump for leaks. If no external leaks are found, check the heater core, cylinder block and cylinder head. 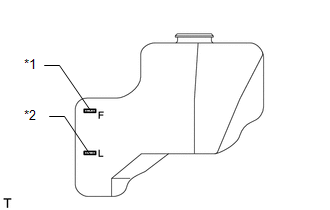 (a) Check that the engine coolant level is between the low and full lines when the engine is cold. If the engine coolant level is low, check for leaks and add "TOYOTA Super Long Life Coolant" or similar high quality ethylene glycol based non-silicate, non-amine, non-nitrite and non-borate coolant with long-life hybrid organic acid technology to the full line. Do not substitute plain water for engine coolant. Do not remove the radiator cap while the engine and radiator are still hot. Pressurized, hot engine coolant and steam may be released and cause serious burns. (b) Check if there are any excessive deposits of rust or scales around the radiator cap and radiator filler hole. Also, the coolant should be free of oil. If excessively dirty, clean the coolant passage and replace the coolant. (c) Install the radiator cap.